Fomalhaut, also known as Alpha Piscis Austini, is the 18th brightest star in the sky with an apparent magnitude of 1.16. Fomalhaut is also the brightest star in the constellation Piscis Austrinus. The name of the star itself is derived from the Arabic phrase فم الحوت fum al-ḥawt, meaning "mouth of the whale". In Latin the name translates as ōs piscis merīdiāni, ōs piscis merīdionālis, or ōs piscis noti. meaning "the mouth of the southern fish" (the constellation itself meaning "Southern Fish"). 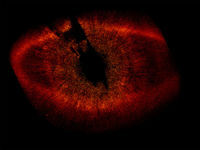 Fomalhaut is known to have at least one planetary companion, famous for being the first exosolar world that was imaged in the visible spectrum. It is possible that Fomalhaut is a binary system. A dim star of spectral type K4-5 Ve known as TW Piscis Austrini is located less than a light year from Fomalhaut and has the same proper motion in space. It is hypothesized that the two stars originated in a single star cluster. Located 25.1 light years from our Sun, Fomalhaut is a white main sequence star of spectral class A3 V. The star is estimated to have some 2.3 times the mass of our Sun, 1.7 to 1.82 times its diameter, and is 14 to 17.6 times as luminous, with a surface temperature of 8,751K. It is estimated that Fomalhaut is around 200 million years old, making it a very young star. However, like other class A stars, Fomalhaut will exhaust its core hydrogen within a billion years and evolve into a red giant before losing its outer layers to become a white dwarf. Comparison between the Fomalhaut system and our solar system. Fomalhaut has both a debris disk and one known substellar companion. The debris, or dust, disk that surrounds Fomalhaut was first discovered in 1983. The disk itself has a very defined inner edge at 133 AU from the star. Because the disk is inclined at some 24 degrees from the plane of the star system, it appears to have a toroidal shape. The disk is seen as a younger version of our own Kuiper Belt. It was the observations of the debris disk that lead scientists to first conclude there was likely a planet just inside the inner edge of the disk. In 2008 a team of astronomers first observed a gas giant type world orbiting Fomalhaut just inside the clearly defined inner edge of the dust disk at an average distance of 115 AU from its parent star, now deemed Fomalhaut b. This newly discovered world is most famous for being the first exosolar world to be discovered and observed in visible light. The exact mass of this world is not known but it is estimated to be no more than three times Jupiter's mass and at least as massive as Neptune. The mean distance for an Earth-like world which could have liquid water on its surface is centered around 4.1 AU, equivalent to between the asteroid belt and Jupiter in our system. Such a world would orbit the star once every 5.5 years.